Semi-Presidentialism: Sub-Types and Democratic Performance - eazydoc.com | Free eBooks Download - EBOOKEE! 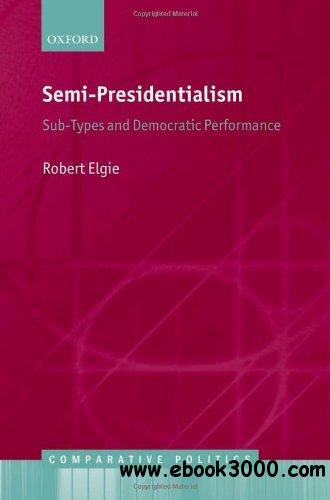 In this book, Robert Elgie examines the relationship between semi-presidentialism and democratic performance. Semi-presidentialism--where a constitution provides for both a directly elected president and a prime minister and cabinet responsible to the legislature--has become the regime type of choice for new democracies. There are now over 50 countries in the world with a semi-presidential constitution and the vast majority of these countries have chosen this form of government since the early 1990s. Semi-Presidentialism operationalizes Shugart and Carey's distinction between president-parliamentarism--where the prime minister is responsible to both the legislature and to the directly elected president--and premier-presidentialism--where the prime minister is responsible to the legislature alone. The book shows that, all else equal, the president-parliamentary sub-type is more likely to be associated with a poorer democratic performance than its premier-presidential counterpart. The evidence is based on a mixed-method approach, including large-n comparative statistical studies of all semi-presidential democracies since 1919, as well as in-depth case studies. No comments for "Semi-Presidentialism: Sub-Types and Democratic Performance - eazydoc.com".